Awesome! That is exactly what is happening in Puerto Rico pro LGBTT health. Awesome local efforts, many with limited or no funding, continue to move an agenda forward to promote LGBTT health. It is a very difficult accomplishment when we have planning meetings at 6:30pm, after finishing our regular paying jobs, or paying a sitter to participate in the gatherings. However, the commitment is worth the results. 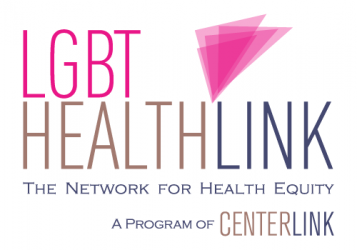 We are looking to educate our communities, students, government, and service providers regarding health needs and realities of LGBTT communities. So here goes a blog to awesomeness! During our October 2012 monthly member meeting, it was decided that current local volunteer efforts by the Citizen’s Alliance Pro LGBTTA Health would focus on maintaining a presence in social media platforms and participate in local and national conferences and events. This will allow us to spread our mission and gather support for healthier LGBTT communities in Puerto Rico. In January 2013, Alliance member, Sammy Arus, participated in the Creating Change Conference in Atlanta, Georgia, including the day-long Union=Fuerza National Latin@s Institute. The gathering brought together a diverse group of LGBT Latin@s and allies from across the United States to foster supportive relationships and build capacity to advance LGBT Latin@ activism. The event was sponsored by Lambda Legal, the National Gay & Lesbian Taskforce, and other national and local groups. Last week, Alliance members, Margie Álvarez and Lissette Rodríguez, participated in the IX National Women’s Colloquium sponsored by the Women Studies Program at the University of Puerto Rico-Cayey Campus. The awesome program included sessions on building a local coalition to work on HIV+ women, women and literature, women in the Puerto Rican diaspora, trans women issues, and much much more! Our support to the only gender studies program in the island is important. Check out Margie’s blog from Cayey, Puerto Rico during the event! This coming week, the Alliance will be participating at the VI International Congress of Health Promoting Universities and the IV Public Health Conference of Puerto Rico in the Puerto Rico Convention Center. 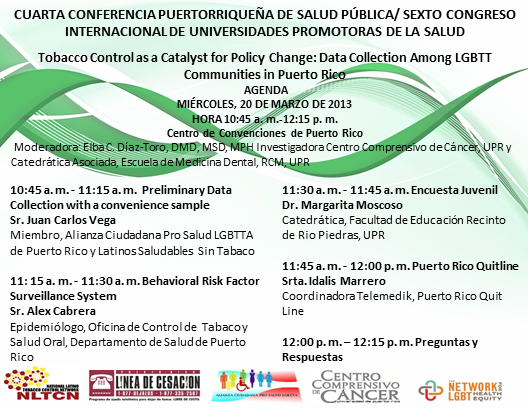 We will proudly present in the panel Tobacco Control as a Catalyst for Policy Change: Data Collection Among LGBTT Communities in Puerto Rico which includes Alex Cabrera Serrano, Epidemiologist at the Department of Health of Puerto Rico Tobacco Control Program, who recently blogged the most recent LGBT tobacco control data from the Puerto Rico Behavioral Risk Factors Surveillance System. Awesome community, university, and government collaboration! In May, we will gather students from Dr. Elba Díaz-Toro’s course on Introduction to Population Sciences Research to lead a discussion at the University of Puerto Rico on the health needs of LGBTT communities in Puerto Rico titled Youth Forum on LGBTT Health. The forum was submitted as a proposal for the IV Educational Conference Against Homophobia sponsored by the local group, Puerto Rico para Tod@s, and will be the closing project for Dr. Díaz-Toro’s course. Finally, our social media guru, Margie Álvarez, reported that the Alliance’s Facebook page had 1,053 visits between February 8 and 14 due to our postings and new content uploaded in our pages. Jedi Librarian Awesome! In addition, the Alliance’s Virtual Library of educational resources currently has over 125 downloadable documents pertaining to LGBTT health and environmental factors affecting our health. 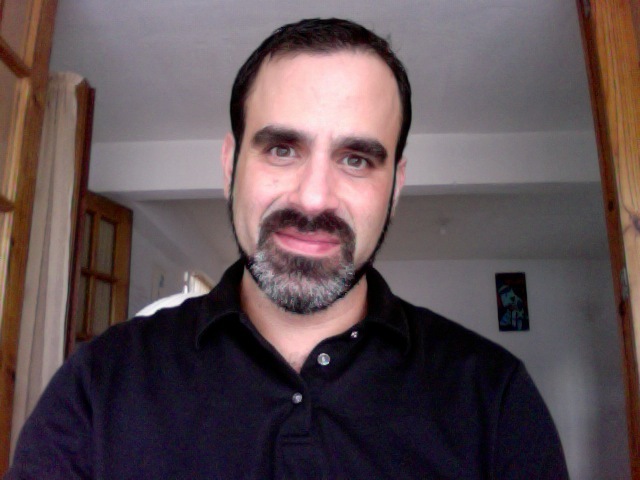 This Spanish-English bilingual electronic library is an integral part of our website, which includes news, events, virtual opportunities, and other happenings pro LGBTT health in Puerto Rico. These awesome efforts are only until May 2013!!! So who knows what will happen by the end of 2013 to promote LGBTT health in Puerto Rico. This blog presents only one of the many community efforts happening in Puerto Rico pro LGBTT health and social justice issues. All these education and sensibilization efforts are even more necessary as we recognize all the victims of crime and violence in Puerto Rico, especially, those most vulnerable including, women, children, LGBTT’s, Dominicans, and elders. I personally want to send all my hope and support to all the human rights battles in Puerto Rico, especially the adoption fight by Alliance friend, health advocate, and University of Puerto Rico Medical Science Campus professor, Dr. Carmen Milagros Vélez. Awesome job my friend! Puerto Rico sentando precedentes. You should all be very proud of the community organizing work your are implementing. You are making a difference in making health a priority for all.